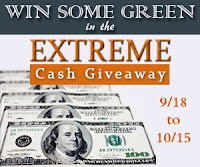 September Extreme Cash Giveaway - #win $400! 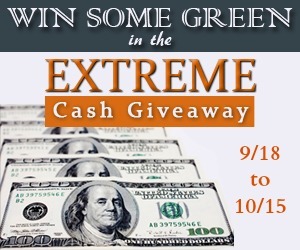 Welcome to the September Extreme Cash Giveaway! The Freebie Junkie has teamed up with Oh My Gosh Beck!, Life With Levi, Children Teaching Mama, HotCouponWorld, For Him and My Family, The Frugal Free Gal, Money Saving Lisa and other awesome blogs to give all our readers the chance to win a $400 cash prize! Start your Christmas shopping early? Romantic weekend away with hubby? Pay an extra month of your mortgage? This giveaway runs for a whole month, so you will have plenty of time to get through all the entries in the rafflecopter form below. There are also daily entries available so be sure to come back every day to grab as many entries as possible! Giveaway is open worldwide and ends October 15th at 11:59 PM EST.